The imageRUNNER 8500 is a high-volume digital production system that sets new standards for speed, performance, reliability, and document finishing. Its 85 page-per-minute speed, combined with a monthly duty cycle of 400,000 impressions, make it ideal for the most demanding production environments. 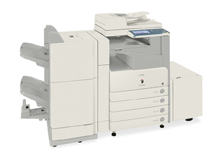 The imageRUNNER 8500 ships standard as a standalone digital copier, but can be easily upgraded to deliver network printing and scanning capabilities. In addition, the imageRUNNER 8500 supports Canon's Universal Send capability, which allows users to scan and "push" documents via communicating machines, including e-mail, I-Fax, FTP and local area networks.